The start line is the little green bubble. They run north through the gate straight toward ave R. They make a right and run over Rayburn hill and then do a clockwise loop on the trail. Coming out of the loop they make a right across the flat area and then go to the left over both of the Rayburn Hills. They reenter the gate and run clockwise most of the way around the park to the finish. 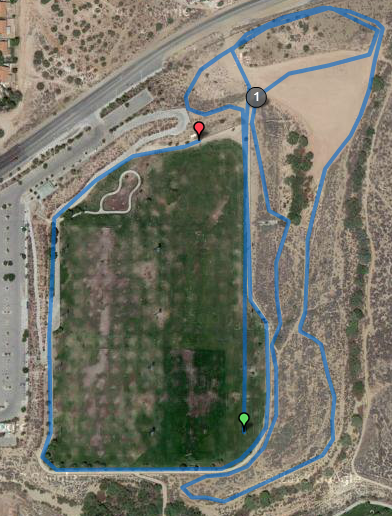 The course is 3K – 1.85 miles. This week we only had a boys race and a girls race. Later in the season we break it up by grade level. (Our finals will also be decided by grade level.) In the boys race, Hillview was absolutely dominant. I expected Leo Oliva to be the top runner this year, based on a solid year of solid training with me and based on the fact that no one could beat him last spring in track. Leo did not disappoint. He won 1st place. I was a little surprised that Cade Ruble hung with him, finishing only 7.5 seconds later for second. The two of them began a nice string of Hillview finishers: Bryce Webb (last year’s top 7th grade boy) was 3rd, Cole Walls 4th, 7th grader Derek Rodriguez 5th, Michael Vidal 6th, and 7th grader Adam Deshields was 7th. Hillview had a perfect score and added two perfect displacers on top of that! Kevin Pacheco – who runs for Desert Christian, but trains with me in the summer and whenever he can, finished 8th followed by two more Hillview runners: 6th grader Brady Butler, and 7th grader Abraham Sosa-Torres. Hillview had 9 out of the top 10! The success did not end there as Hillview runners came in 11th, 12th, 18th and 19th. 13 of my boys scored a top 20 finishers medal! The girls race was a little different. Last year, Joe Walker had 5 very fast 7th grade girls. They were unbeatable. Their top girl, Mariah Castillo, even won her race at Mt Sac! Sure enough, Mariah ran away with Thursday’s race. Hillview 7th grader, Natatlie Gutierrez, however ran a huge PR and took 2nd place, finishing ahead of all the rest of the Joe Walker girls. 7th grader, Kiley Gilmer finished 6th further breaking up the Joe Walker sting. Joe Walker did win with girls in 1st, 3rd, 4th, 5th, and 7th. Three Sacred Heart girls placed 8th – 10th (including 5th grader Maggie Theologidy – wow) then 3 Hillview girls: Lauren Heath and 7th graders: Josie Ferriera and Brooklyn Smith. You can see the theme here: 4 of Hillviews top 5 girls and 9 of the top 10 were 7th graders! Joe Walkers number 3 girl was a 7th grader. Their next 7th grader came in after Josie and Brooklyn. So, when we break it up by grade level the Hillview 7th grade girls look to be in good shape. Natalie, Kiley, Brooklyn, and Josie are all strong returning runners. There are a few brand new girls who look like they will fill in nicely. The 8th grade race would seem to be Joe Walker’s to lose, but it could get interesting. They had NO 5th 8th grade girl. The rumor is that they do have one but that she would likely be the last scorer. Hillview, was missing two of their top 3 8th grade girls. Gabby Castro, last year was able to break up the Joe Walker pack and keep them from a perfect score. She should be in mix near the top once again. Helena was our number 3 girl and she will be back. There are a couple of brand new girls that look to be promising with just a little more training. So, if we can break up the top 4 a bit and get the rest close behind, AND the other schools field full teams of runners the league finals could get interesting. We will have to see about this year’s 6th grade teams. The only standout thus far is Brady Butler – and he looks to be quite a standout! Yesterday, Friday, we celebrated our first meet with a run to Jamba Juice! You know, for years, I have recalled a song I played in the Orange Coast College band. The song was called Jambala! It repeated the line “On the road to Jambala”. I searched and searched for it only to find out it was Shambala! Oh well, it still makes a nice background. btw, the Achilles seems to be improving very quickly!